Astro Pak offers RGA and Vacuum Bakeout, Helium Leak Testing services alongside our Precision Cleaning, Passivation, and other related offerings. Our state-of-the-art ISO 9001:2008/AS9100 Certified cleanroom facility in Downey, CA houses several vacuum chambers and ovens of varying sizes and capabilities including a 40” x 40” cube with Vacuum Bakeout up to 220˚C. Our Residual Gas Analysis (RGA) mass spectrometer utilizes temperature and vacuum to drive off residual moisture and semi-volatile contaminants. Moreover, this achieves very stringent levels of cleanliness and dryness while characterizing and quantifying micro-contaminants. In addition to RGA and Vacuum Bakeout services, we also perform Pressure & Leak Tests including Helium Leak Testing and Hydrostatic and Pneumatic Testing. We test gauges, valves, tubing assemblies, and other components, as well as in-place systems, vessels, and equipment. Moreover, we routinely Precision Clean, Test and Package hardware and componentry for critical cleanliness industries such as aerospace, military, commercial aircraft, semiconductor, medical device, laser, compressed gas vacuum and more. Whether your requirement is for precision cleaning, RGA Testing and Vacuum Bakeout, or other industry & company standards – Astro Pak stands ready to serve. 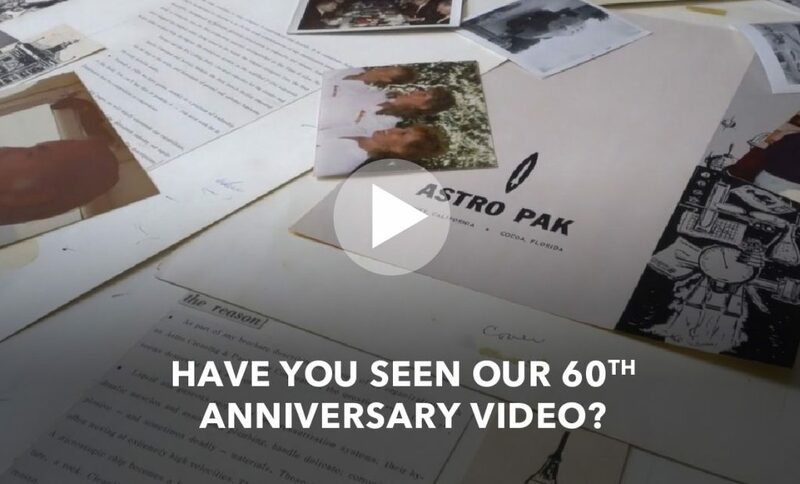 Over the course of the nearly 60 years, Astro Pak has gained experience and expertise for testing a variety of different fabrication materials including stainless and carbon steel, composites and other exotic alloys and materials. Our state-of-the-art testing equipment validates thousands of vessels, pipelines, valves, filters, pumps, and more. Accordingly, our highly trained technicians and management staff have a keen understanding of ASME, ASTM and other testing specification authorities. In addition to RGA and Vacuum Bakeout, we also a variety of cleaning and packaging services. All hardware and components that enter our cleanroom include real-time electronic tracking to keep customers better informed on the status of the order. In addition to Cleaning and Packaging, we also allow customers to come onsite and assemble their own parts after cleaning. Our services also meet the requirements of literally hundreds of industry specifications. This includes aerospace contractors, ULA, NASA, the Department of Defense, and many private industries and organizations. In addition, our Certification packages are QMS/cGMP compliant for your systems and equipment maintenance records. Let our experienced and credentialed team of chemists, engineers, and other professionals on staff EXCEED your expectations. Contact us today for more information about RGA & Vacuum Bakeout Services!